The food Calorimeter allows students to determine the amount of energy released through the burning of food. This easy method involves the measuring of the change in temperature of a sample of water from the combustion of a small amount of food. The experiment introduces concepts in thermodynamics and leads to an understanding of energy and its relation to food consumption. 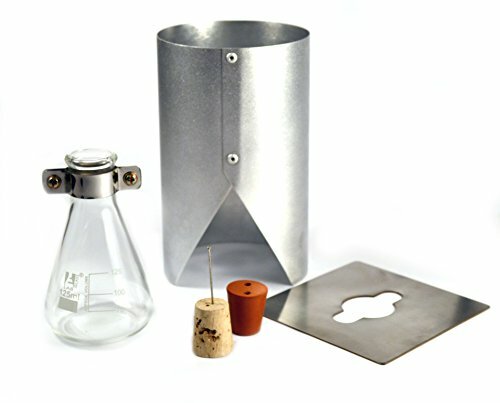 Kit contains: Erlenmeyer Flask (125ml), Cylindrical Metal Stand 4" Diameter 6.75" Tall , Metal Suspension plate 4.5" x 4.5", Cork with Nail (Food sample Holding assembly), Rubber stopper. A calorimeter is an instrument used to measure the amount of heat produced in a chemical reaction. I remember in the chemistry classes we used to mix some chemicals and we were to observe the reactions. There were some reactions where we said heat was produced, we tested this by just holding the test-tube and feeling whether it was warm or not. By feeling with our hands we cannot determine the amount of heat being produced, but thanks to the best calorimeters we can now measure the amount of heat that is produced in a chemical reaction and even calculate it. This calorimeter has a very special lid. The lid has a coil mounted on it which is heat resistant. 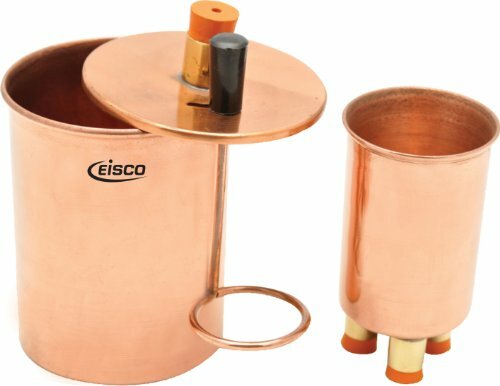 It is through this coil electric current is passed through leading to heating of the content in the calorimeter. The lid also has a post that is bind to electricity. This post accelerates the rise in temperature five times more within a very short period of time which is approximated to be around ten minutes. The post and the coil are covered in such a way that electrolysis is avoided. Electrolysis is the process by which ionic compounds are broken down when current is passed through them. The calorimeter has a diameter of 4 inches with a height of 7 inches. The stopper which is made of rubber has a hole where the thermometer is placed to measure the temperature. 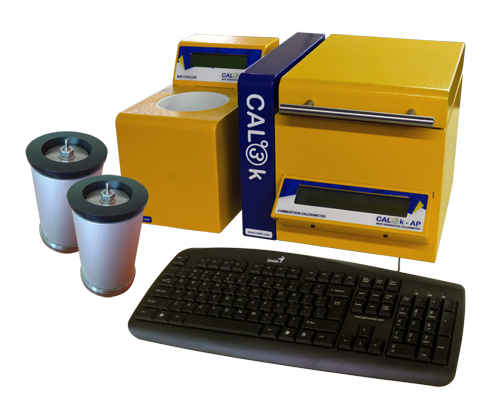 The calorimeter comes with a stirrer that is used to mix the samples hence ensuring equal distribution of heat. 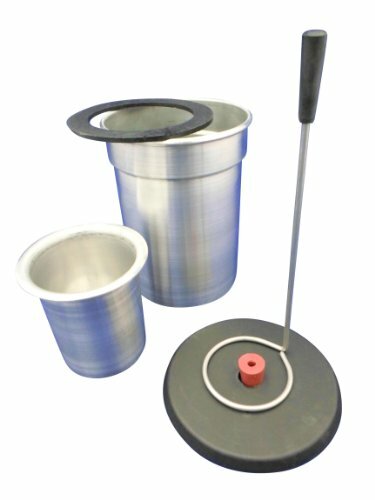 This calorimeter has an insulated handle. This means that the handle cannot transmit heat, the person handling it does not have to worry about being burnt. This element of having an insulated handle gives it a plus point. This calorimeter is very pocket-friendly, it only costs $11.97. This calorimeter has two walls, the outer wall has a diameter of 115 millimeters and a height of 4 inches. The inner wall has a diameter of 61 millimeters and a height of 2.85 inches. The wall is made of aluminum hence the high quality is a guarantee. A Styrofoam which is molded is placed in between the walls to separate them. The Styrofoam has two major functions one of them being to act as an insulator and another one is to offer protection to the walls. The outer wall is enclosed with a transparent cover made of plastic. This cover is made in such a way that it only allows light of regulated wavelengths. This ensures that the ultra-radiation does not tamper with the temperature in the calorimeter. 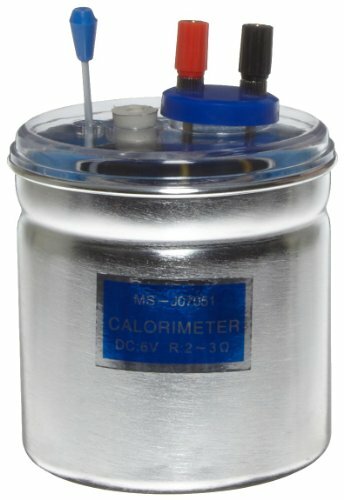 This calorimeter has an adapter that can withstand voltages of up to 6 volts. It has a stopper that is made of rubber and a hole that allows a thermometer to pass through. In this, the thermometer is not within the calorimeter hence it is inserted through the hole in the rubber stopper. This is one of the most pocket-friendly calorimeters in the market, it goes for only $9.95. This food calorimeter enables one to test the amount of energy produced when heating food. This instrument is very important to people who are cautious on their diet. This is because it enables them to know the amount of calories they are consuming per the meal they take. The energy produced is measured by checking the rise of temperature in the water in the flask. This is possible because one calorie can raise the temperature of one gram of water. The calorimeter has a conical flask with a volume of 125 millimeters. This shows that it can hold a reasonable amount of sample to be tested. It has a stand made out of metal which is approximately seven meters tall and a diameter of four meters. The stand is cylindrically shaped hence the calorimeter is stable. This calorimeter has a cork that ensures the sample does not spill during the heating process. The food calorimeter explains the concept of thermodynamics. This way one can understand the amount of energy the food he or she has consumed will produce. With this calorimeter the issue of eating too many calories. With the quality and the services this calorimeter offers, it is worth the price of $38.99. From the name premium, it indicates its high quality. 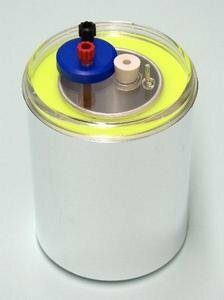 Apart from the double walls, the calorimeter has a heating element that is removable. It can withstand high temperatures of about five volts. The flask of this calorimeter is made of aluminum. 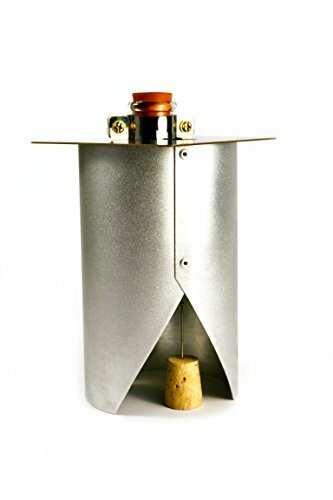 This aluminum acts as a regulator of heat and light that is to pass through the wall of the flask. The volume of the flask is larger compared to that of the food calorimeter. This reservoir has a capacity of 150 millimeters. 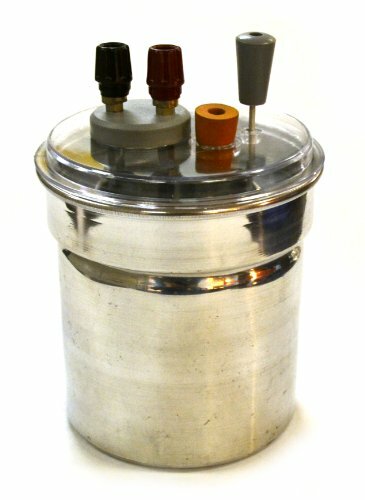 This calorimeter has a plastic insulator which is placed between the inner wall and the outer wall. This insulator is responsible for ensuring there is no heat loss. In addition to this plastic insulator, the inner wall is covered with a Styrofoam. With this plastic insulator and Styrofoam, the results obtained are very accurate because there is minimal loss of heat. The outer wall has a diameter of 4 meters and a height of 4 meters. The inner wall has a diameter of two and a half as well as the height. This calorimeter is pocket-friendly as it goes for only $17.22. From the above calorimeters, we can see there are some features that are common in all the calorimeters. The calorimeters have two cylinders commonly referred to as vessels. There is an inner wall and the outer wall. Between the walls, there is air filled to act as an insulator. This insulator is responsible for ensuring that the heat of the content in the inner cylinder is not transmitted to the outer cylinder. 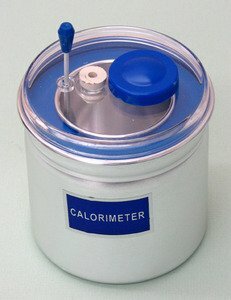 The calorimeter has a thermometer that is used to measure the temperature. The stirrer in the calorimeter is used to ensure that there is an even distribution of heat in the cylinder.